In the rock world, music is dominated by bands consisting of a more or less consistent group of players. There are also solo artists, some of whom have set backing bands, but those musicians are rarely granted much more than an occasional spotlight during a performance. Jazz, on the other hand, has always been about the musicians individually, coming together in various configurations for a time, sometimes being a leader, sometimes a guest, spreading ideas around — nearly every sideman on a famous leader's album has albums of their own. For decades there’s been a stream of jazz created by getting together a set of musicians for a session and seeing what happens. The Stone House is a modern example of this strategy. Mark Wingfield (guitar), Markus Reuter (Touch Guitar), Yaron Stavi (bass), and Asaf Sirkis (drums) are all creative musicians who between them span the worlds of jazz, rock, classical, and electronic music. Stavi and Sirkis have worked together fairly often, both in Gilad Atzmon’s Orient House Ensemble and (even more to the point) on Wingfield’s Proof of Light album. As far as I can tell, this is the first time Reuter has worked with any of the others. The four gathered in a recording studio built in an old mansion in Spain (the Stone House of the title), and had time to improvise, work out some pieces, and record at their own pace, and this album is the first result of their time together. (Word is that much more music was recorded and will see release in the future.) Given that Wingfield is a somewhat atmospheric player rather than a shredder, you know not to expect high-powered fusion, and combined with Reuter’s abilities in creating shifting soundscapes, it’s no surprise that one of the main features of the set is an ever-shifting wash of notes. 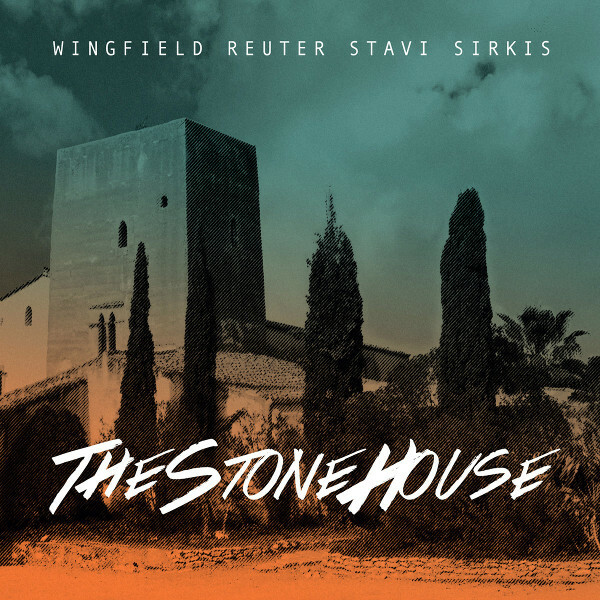 On and around that ambience, Stavi and Sirkis provide rhythmic interest in widely varying tempos, from loose and free to fairly aggressive; Wingfield contributes much of the melodic content with soloing and some worked out phrases. His tones are lovely as always, with woozy whammy bar action and lots of fluid phrasing. There are a few times when the lead parts are identifiably Reuter, as on “Silver,” which is the most thoroughly worked out piece. It features busy eighth-note patterns from both Reuter and Wingfield while the bass and drums throw out some great energetic action. But whether composed or improvised, The Stone House is outstanding from start to finish, eminently listenable, and should find a home in the collections of fans of both electric jazz and that flavor of progressive rock represented by Stick Men and most of the artists on Moonjune and RareNoise.